To me (Amy), this speaks of a early school morning drinking tea, with plenty of good conversation before we all start the day. Now that one of my children has to remain gluten free (with amazing results after only a month of staying GF), I am more determined than ever to make eating less of a hassle for him. Having something that the entire family enjoys together is such a relief. This recipe fits the bill. 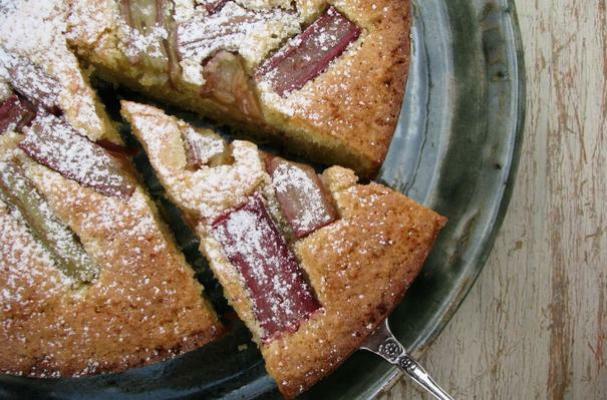 Gluten Free Rhubarb, Lemon and Almond Cake is a new way to serve all that rhubarb you have stocked in the freezer. It is full of flavor and rich with the decadent taste of almond meal. The bonus is that all that flavor makes a Gluten Free masterpiece!